I’ve just returned from a holiday in Venice, where I saw, on every narrow strada I wandered, a crowded shop selling ornate Venetian masks. Typically worn during the Carnival of Venice, these masks have a colourful history. One of their uses: to obscure the wearer’s identity and social status, allowing social interaction outside the bounds of everyday convention…and, in many cases, outside the bounds of propriety and morality! After I completed my doodle, my 13-year-old pointed out that I’d drawn a “plague doctor” mask. With a long beak that makes it one of the most recognizable and bizarre of the Venetian masks, the Medico Della Peste mask’s macabre history originates with 17th century French physician Charles de Lorme, who adopted the mask while treating victims of the Italian Plague. To protect from airborne diseases, plague doctors filled the mask’s bird-like beak with herbs and scented substances like lavender. “Cool,” I said. “You learned that it school, did you?” “No,” he said. “On a video game. Assassin’s Creed.” And all this time I thought those games were just turning his brain to mush. I completed my “plague doctor” Venetian mask doodle on my birthday. Total distance: 41 kilometres – one kilometre for each year of the age I wish I still was. 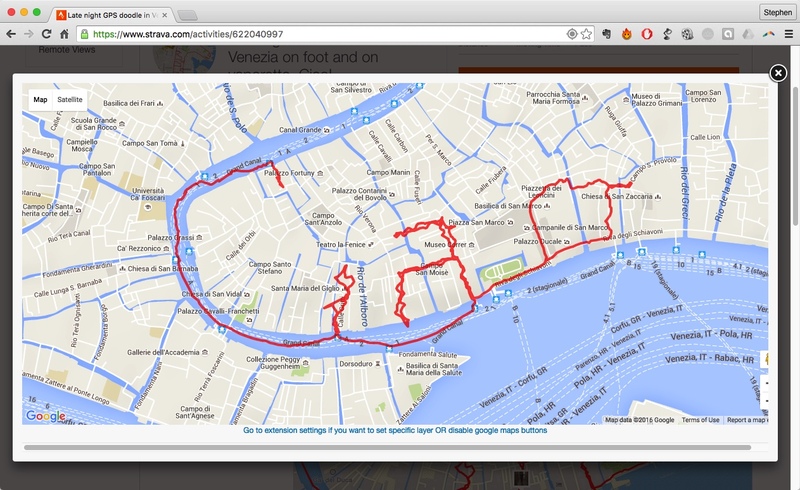 This entry was posted in gps art and tagged Carnival, creativity, gps art, Italy, mask, Venice. Bookmark the permalink. Hey Heather – we really enjoyed Venice, though we spent much of our time there hopelessly lost in the labyrinth. But that just added to the adventure. On our first evening in Venice, we spent HOURS looking for a restaurant we’d passed earlier in the day. We eventually found it…but by then it was closed. Someone had told my wife “If you see something you like in Venice, buy it there and then…because you’ll never find it again.” Good advice, I would say. I’m (selfishly) very relieved to hear you spent much of your time hopelessly lost in the labyrinth, Stephen — I’ve never been anywhere quite like Venice, where you can literally be holding a map and faithfully noting every intersection and STILL get lost. My husband and I also had the *exact* same restaurant experience you and your wife did. Fortunately, when we went back last September we happened upon the restaurant again (in a totally different location that either of us remembered, of course) and dined there several times. But I think that sense of mystery and serendipity only adds to the magic of the place. I love your “walking doodle,” by the way! It’s actually quite impressive, given the terrain and the obstacles (from lost tourists to interesting shops) one encounters in La Serenissima.